There's no question that we need to seriously consider harvesting the sun's energy in space with massive solar panels. The big question, however, is how to get all that energy back to Earth. NASA believes they have found the answer: Power-beaming solar-power satellites. It's a plan that was developed by John Mankins, leader of the first NASA solar-power-satellite development team in the 90s. 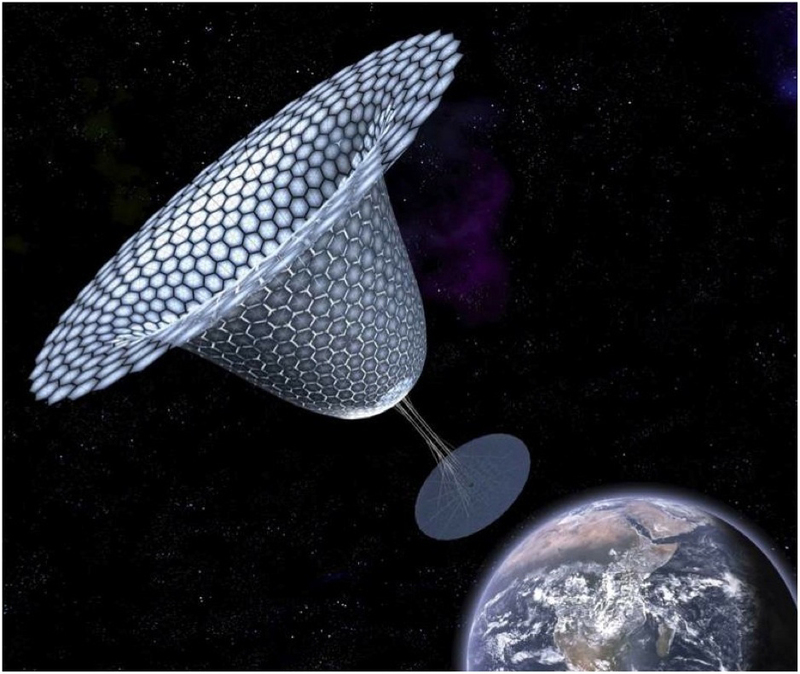 He calls his proposed project SPS-ALPHA, which stands for Solar Power Satellite via Arbitrarily Large PHased Array. Mankins claims that it's the “first practical solar-power satellite concept” that uses a novel “biomimetic” approach. This project would make possible the construction of huge platforms from tens of thousands of small elements that can deliver remotely and affordably tens to thousands of megawatts using wireless power transmission to markets on Earth, as well as missions in space. It would do this by using a large array of individually controlled thin-film mirrors, outfitted on the curved surface of a satellite. These movable mirrors would intercept and redirect incoming sunlight toward photovoltaic cells affixed to the backside of the solar power satellite’s large array. The Earth-pointing side of this large modular circular array would be tiled with a collection of microwave-power transmission panels that generate the coherent, low-intensity beam of radio frequency energy and transmits that energy to Earth. And what's particularly cool about this concept is that it would enable the construction of a solar-power satellite that can be assembled entirely from individual system elements that weigh no more than 110 to 440 pounds (50 to 200 kilograms), allowing all pieces to be mass produced at dramatically lower cost than traditional space systems. In my opinion there is a question. Instead of listing all issues here I'll refer to this post: http://physics.ucsd.edu/do-the-math/2012/03/space-based-solar-power/. I am sure more scholarly reviews of the issue exist elsewhere, but the above provides a good overview and I have the link handy. Also, and it is not mentioned in the above analysis, there is a fundamental issue with bringing energy to Earth by any means. If an additional energy influx from human activities is not considered, Earth is a pretty balanced system. 174PW of the solar income are ether absorbed by land or reflected/radiated back. If there is an additional energy influx from human activity, the balance is upset. At the moment the world energy consumption is increasing by approximately 2.3..2.5% annually. Most of the energy is a direct influx rather than tapping one way or another into the solar income. With such rate the surface temperature would rise to the boiling point in about 300...400 years. Space based energy generation does not solve the overheating issue. It is still the same influx of additional unbalanced energy. There are only two ways to avoid the issue. One is to decrease the solar income to balance the additional energy. The second solution is to have all energy generated from solar income down ON the earth surface. I stress "on the surface" because in that case no additional influx would be generated.